February | 2011 | Elaine Reads . . . constantly! Desperately seeking a husband . . .
Suzette is not like other heiresses; she wants a poor husband, a gentleman who will be so grateful for her dowry that he will allow her access to it so that she can pay off her father’s gambling debts. When this alluring beauty encounters Daniel Woodrow—handsome, titled, single . . . and even more impoverished than she could have hoped for—it seems Suzette’s wildest dreams have come true. 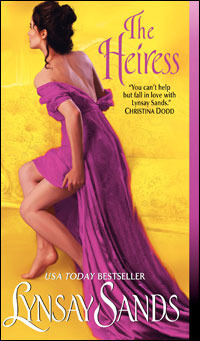 Like the previous book in this series (The Countess), The Heiress is a bit of a disappointment. Lynsay Sands books are generally very funny. Although this one has its moments, it is not up to her usual standards. This book takes place for the most part at the same time as The Countess. As a matter of fact, it is 200 pages before any truly new material is introduced. The explanations given of the back story are clumsy and poorly written. I realize each book is supposed to be able to be read as a standalone, but how realistic is that really? I was also disappointed that there was no further development in the relationship between the third sister, Lisa, and her probably suitor Robert. I have read somewhere that the third book is not scheduled for release until sometime in 2012. I find that odd because the first two were only release a month apart. I am afraid that only a true Lynsay Sands fan will enjoy these books. I hope no one uses them as an introduction to her work. I wasn’t sure I was in the mood for this book, but I normally love the Eve Dallas series, so I gave it a try. I am so glad I did. This one was even better than normal. Although you know who the bad guy is from the beginning, the search for evidence was fascinating. Another plus for this book is that some books in this series are very graphic in the horrors the victims experience. This one did not dwell on that aspect which I certainly appreciate. It’s funny that I don’t normally read Nora Roberts’ (J. D. Robb’s real name) books. 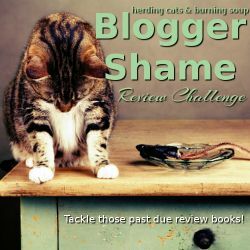 I have read some and enjoyed them, but they are definitely not on my “must read” list. I never miss an Eve Dallas book though. I don’t normally read short stories because I don’t think there is enough to them to for plot or character development. I only read this one because it is one of last years Teens Top Ten nominees and I am still trying to get through them. Another reason I don’t like short story collections is that there is no consistency in quality or maybe interest is the better word. This book is no exception. I really liked the first story about a Star Wars fan and a Star Trek fan hooking up at a convention. Their friends were appalled that they would associate with someone from the “other side.” Since I am a fan of both series (although, Star Trek will always be my favorite), I got a kick out of this one. There were just enough good stories in the collection to keep me reading. I had to finish them all just in case there were additional gems to be found. I really loved the beginning of this series, but have lost interest with the later books. I think this would probably be a good series to read straight through because there is so much going on, I lose track between one book and the next. I do have problems with the fact that none of the adult vampires seem to be capable of seeing dangers that Zoey and her friends easily perceive. In all of their years, sometimes centuries, of life, the adult vampires have not learned to recognize when someone is lying to them. I will continue to read the series because I am invested in the characters. However, I do not have to be the first person to read the latest book. I just don’t care enough to fight for it! This is the book that actually hooked me on the series. Book one was interesting enough to make me read book two. Book two introduces Miles and the difficulties he faces. In book three, this book, I fell in love with him. I am absolutely in love with these books. Magnus Pack is the first series I read by Shelly Laurenston and I thought they were good if not wonderful when I originally read them. I felt her later books were much better. Now I think they are all wonderful. I like the fact that the full human females are just as dangerous as the shape shifting males. I particularly like the fact that everyone is scared of them. It completely confuses the shapeshifters because they think it should be the other way around. I have read these books so many times, I think the words have faded on the page. When I first read this series, I thought it was pretty good, but not wonderful. Now, Shelly Laurenston is one of my all time favorite authors. I just read them over and over again.